So, as I walked in I was greeted by someone at the door who asked for a dollar donation, in exchange for some bread. I thought why not. What’s a DOLLAR if it helps cure Breast Cancer? Unfortunately, I ate mine before I took a picture (woops!) but it was pretty much identical looking to the picture from this website listed above. But, it was delicious. One of the best dollars I ever spent. It was chewy, light and fluffy in consistency. It had a rather sweet flavor, with hints of cinnamon as well. 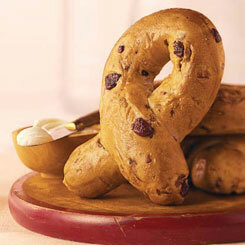 There were a few scattered dried cranberries in the bagel, which added just a touch of unexpected flavor. In all honesty, it was perfect by itself. I ate it as is, kind of like how someone would eat a hot pretzel. I just tore off parts of the bagel and ate it. However, I definitely think it would be awesome with butter or some cream cheese! What’s your favorite type of bagel? I really like cinnamon raisin ones! Wow, what a great concept! It sounds pretty tasty too! do i eat bagels? no. do i love bagels? oh, yes! warm, white ones. no spices. no shmears. just doughy, nutritionally void goodness! no – stupid promotion of breast cancer preventions part. Processes carbs are what cancer feeds on.